Whenever I get an idea in my head of something that I wish to try…I always check out Smitten Kitchen first. Sure enough, a perfect recipe always appears. This is not a weeknight meal, but it is a brilliant, wintry Sunday supper of the exact kind of comfort food that we all know you’re craving in January/February! 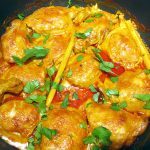 The good news is that this dish could also be made ahead, up to the making/cooking of the dumplings – and after all of the effort (time, not difficulty), this recipe below was more than enough for 2 full meals for us 4 big eaters – enjoy! For the stew – pat the chicken dry with paper towels and season well with salt and freshly ground pepper. Heat up 2 teaspoons of the oil in probably your largest Dutch oven over medium-high heat, add half of the chicken and cook until golden on both sides – this will take about 10 minutes. Remove the chicken to a large plate, pour out and save the chicken fat from the Dutch oven, then add the remaining oil and repeat the cooking process with the rest of the chicken, including pouring off the fat. When the chicken has cooled slightly, remove the browned skin from every piece – the meat may still be pink, but don’t worry, it’s going to get cooked again in the stew. Now add the butter to the Dutch oven at medium-high heat, allow it to melt and then add in the leeks and onion and a sprinkling of salt. Cook and stir for about 7 minutes until all is softened, then stir in the flour until there is no trace visible, then whisk/stir in the sherry, making sure to scrape up any browned bits. Add in the broth, milk, thyme and bay leaves, stir well to combine, then nestle in all of the chicken thighs with their accumulated juices, bring everything to a boil, then cover and simmer gently for about an hour until the chicken is fully cooked. Turn off the heat. Here’s where more of your time is needed. Once the chicken is cooked, carefully remove each piece to a large baking sheet or a large platter. When it’s cool enough to handle, shred the chicken, removing all bones and inedible bits. At this point the sauce may have settled and you may wish to skim off some of the fat, do so if you wish and also remove the bay leaves. Return the chicken meat back to the stew, discard the bones, and bring everything back to a simmer while you prep the dumplings. For the dumplings – stir together the flour, baking powder and salt in a medium bowl and in a small bowl, stir together the milk and fat and then microwave it until the liquid mix is warm. Stir the warm milk mix into the dry ingredients and stir well with a sturdy spatula until well combined and smooth. When the stew has returned to a simmer, taste it to see if it needs anymore salt and pepper, then stir in the peas and tarragon. Gather a golf-ball sized portion of dumpling batter onto a spoon, then push the batter into the stew using a second spoon. 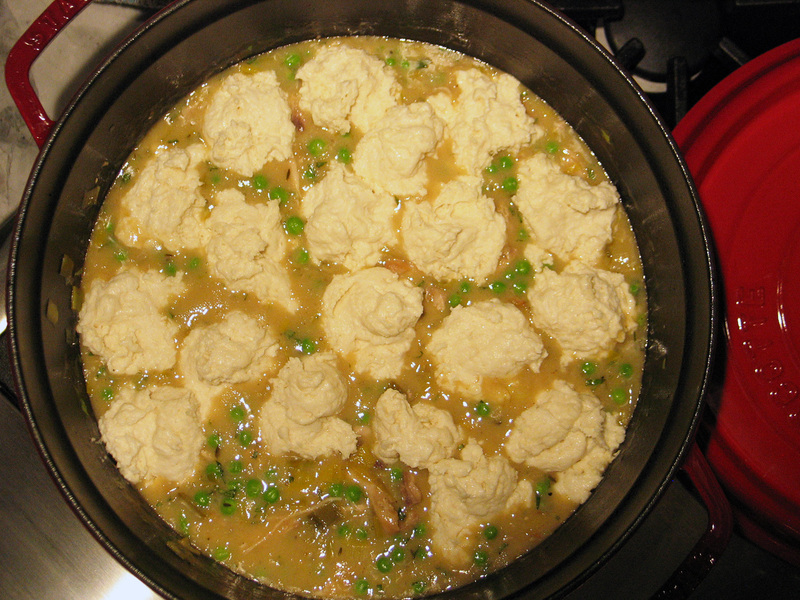 Try to leave a bit of space between dumpling, but this amount of batter will definitely cover the entire top of your stew, I got 20 dumplings – the photo was taken as I was adding them. Reduce the heat to low, put the lid on your Dutch oven, then allow the stew to simmer for about 20 minutes until the dumplings are done (mine took closer to 25 minutes). When they’re done the dumpling tops should not be sticky, and I found that the dumplings expanded so much that I couldn’t even see the stew – this is sweet perfection. Serve up the chicken and dumplings in big bowls and be prepared to eat way more than you planned to!